I try to work my way down the chain of "whys" as far as I can go, but eventually I have to either engage in some circular logic for awhile in the hopes that she'll eventually lose interest ("Why do we like doing it? "~"Because it's fun. "~"Why is it fun? "~"Because we like doing it. "), or I have to come up with some creative redirection to make her forget what we were just discussing. I'm really trying hard not to stop at "because." I remember all too well how frustrating an answer that can be. Amidst her general thirst for knowledge, she's developed a new focus; one that I find agonizing and inspiring all at once: she's determined to learn Spanish. It's agonizing because I want so badly to teach it to her, but I don't know enough myself, inspiring because my heart burns with pride at her desire. I had that same intense desire myself when I was not so much older than she is now; so much so that I would chatter nonsense out loud at times just to feel what it must be like to have another language pass my lips. Sadly, though my mother began to teach my siblings and me when we were still quite young, she was instructed to stop when my oldest brother demonstrated a severe language delay, and I never was able to incorporate what I learned in school in a way that resembled actual fluency. Over the years, with lack of use, I've mostly forgotten the little that I ever knew. This is not a new conflict for me. I've been wringing my hands over how I would approach the situation ever since I learned I was pregnant with Abigail. It's been my hope that Mima and Papa could lend a helping hand, being native speakers themselves, but neither is really around Abby enough to make a difference, and when they are- well- the novelty of the visit trumps any thought of special time spent language-learning. I've also known for awhile that Abby had an interest. After all, one of her favorite things to say is, "Agua is Spanish for water." But then, I had an enlightening conversation with her after reading a counting book to Michael this morning. She proudly announced to me, "There are numbers in Spanish, too. One is uno. Two is dos. Three is..." Her face crumpled in distress as she struggled to recall it. "...I can't remember..."
My heart melted. "It's okay, Abby!" I jumped in. "You remembered one and two, uno and dos, that's great! Three is tres." My jaw dropped. I hadn't realized that she knew more than a couple of numbers in Spanish. Apparently, she wanted to know more, because she then asked me, "What's six? What's seven?" We went through them, all the way up to twenty. I knew, in that moment, I was going to have to find a way. For her sake. For mine. We'll do this thing- together. It's International Babywearing Week, and- quite conveniently- I've just received a woven wrap as a late birthday present. In honor of the week, and to document the experience, I'm going to try to post a picture each day of a carry that I've tried and how it worked out for me. You can see pictures of my very first attempts in yesterday's post. Actually, today's is on the right. The left is from yesterday but I put them side-by-side so that you can see how I've improved upon the technique. 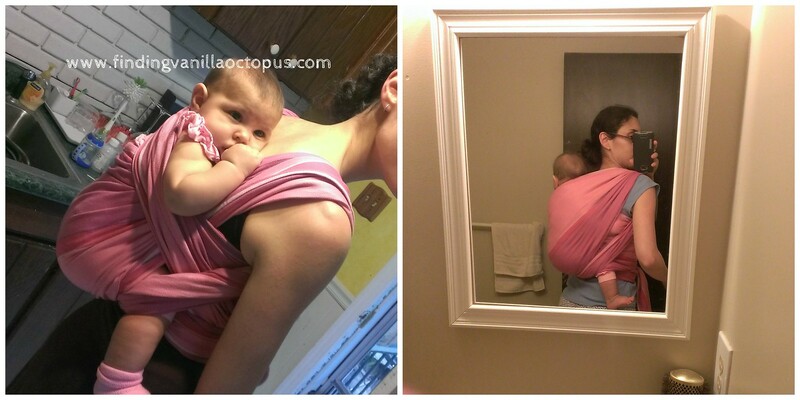 Thanks to some critiquing from online babywearing mothers, I determined that I had not properly spread the second pass all the way across Mia's back from neck to bum. You can see it gathered behind her neck in the first picture. Though I've still got some other adjustments to make to improve the carry, I did fix that for the second photo. It's nice and smoothly spread across the back. The best carry of the day, however, I managed with Abby, who has been itching to get up on my back ever since she first saw the process demonstrated with Michael in the Ergo. Though she sadly weighs too much for that carrier, the woven can manage her weight, and then some. 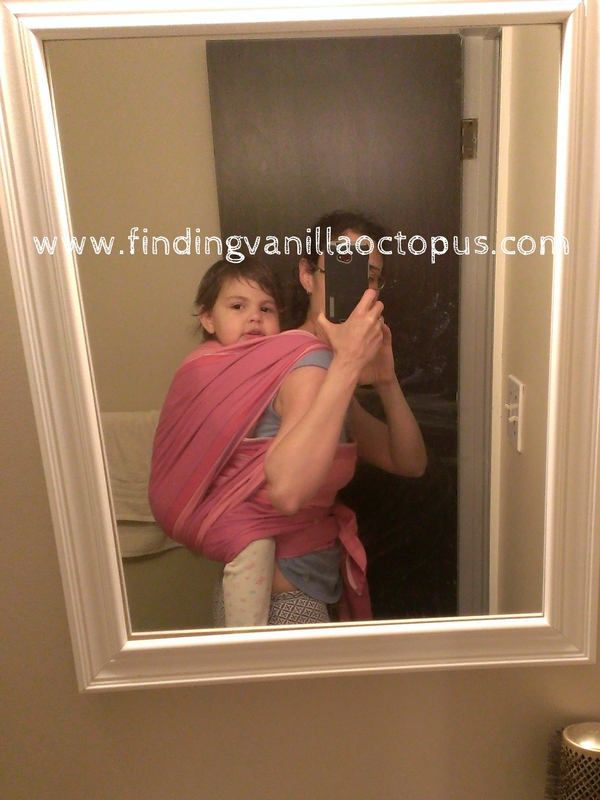 She ended up being even more comfortable to carry around than Mia was, since I got my torso more tightly wrapped with her, which relieved the pressure on my shoulders. Next time, I'll instruct her to put her arms up so that she can have them free for use. Then we'll really have some fun.